If you like eating and drinking, New Orleans is the city for you. Well, that‘s the only thing you can do there. Sure, there are museum, aquariums, parks and churches that you could visit but compared to other cities, it doesn’t offer that much in the cultural aspect. Don’t get us wrong, New Orleans is a great city with lots of history but that history has been tarnished by the drinking and partying around the French Quarter. It is known for the debauchery of Mardi Gras, that has transcended the carnival period. Every day is like Mardi Gras in New Orleans except that there are no floats and festive music. But there sure is drinking, beads and ladies flashing everywhere. As much as we like drinking and partying, there’s more to New Orleans than that. And we are talking food. You will find the most amazing food in New Orleans than anywhere else in the good old USA. But be warned, food this good is not cheap. The Big Easy is one of the most expensive cities in the nation; drinks are ok while eating can be quite pricey, especially if you go to fine dining locations. And this city is full of chef oriented restaurants. So if you plan to go, be sure to include that in your budget. We understand the fascination with the French Quarter; it is very different from any other place in the USA. With its colonial architecture, one is transported immediately to another time, to another era. We won’t bore you with history details. You can check the history by visiting this website: http://frenchquarter.com/history/shortquarterhistory.php. There you will find how it got its name, how it was a French Canadian to Spanish to finally becoming a colony of the United States in early 1800. All that history, changes and mix of people, made what New Orleans is today. It is a mix of French, Spanish and African culture at its best. One can say that is a Caribbean or even Latin American city nested in the United States. That part we absolutely loved. What we didn’t like was Bourbon Street. If you are under the impression that this famous street is full of blues and jazz clubs, you are in for a big – not in a good way - surprise. But then again, we didn’t do a good research, for after all in the 40’s and 50’s, “The most interesting City in America” was known for exotic and risqué performers and dancers clubs. Back then, the elite society will go to Bourbon to catch a burlesque show while the gangsters will go to that same street but to visit the prostitutes and strip clubs. Now, Bourbon has no burlesque shows but a lot, and we mean a lot of strip clubs with girls in the doors showcasing what they will do inside (plus more) and the clubs windows and doors are covered with pornographic photos. 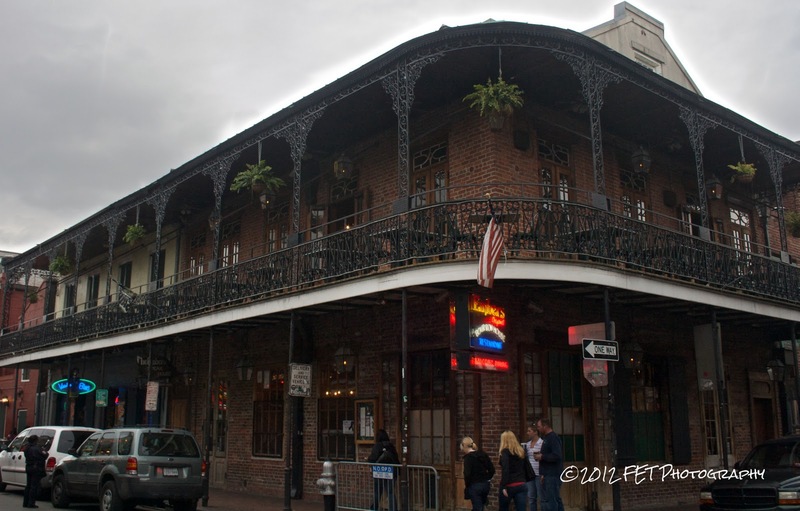 There are of course other nice bars like Pat O’Brians (second location, original is on St. Peter), Fat Tuesday (the original daiquiri bar), Howl at the moon and our favorite Lafitte’s Blacksmith Shop, the oldest bar in the city with no lights, lighted up by candles. If you are looking for music, like we were, walk a few blocks pass the Quarter and go to the Faubourg Marigny district (pass the French Market) and walk to Frenchmen St. There you will find at least 3 or 4 blocks of music venues (that don’t have any cover price) where you can listen to good blues and jazz bands like the Blue Nile and Café Negril, among many others. Our favorite street in The French Quarter actually was Royal Street. It runs parallel with Bourbon but it is full of antique shops, restaurants and art galleries. If you are in the city on a Friday, you need to go to the French Quarter and stroll around this street from 10:30 am to 3pm approximately. They close the street so no cars can transit through it to give the opportunity to street performers to share their craft. You will find blues and jazz bands, solo musicians, clowns, mimics… everything of everything and it is a sight to see. Other sights that you can’t miss are the St. Louis Cathedral in the beautiful Jackson Square. If open, try to walk around the garden that faces Royal St. If not, you can see it from outside. It is flaunted by The Cabildo and The Prebystere, a city history museum and a Mardi Gras museum respectively. You can stroll through the Moonwalk, a park and pedestrian walkway that faces the famous Mississippi River. Is not the most beautiful park nor river, but at least you can say you were there. Before our trip, while we were looking at things to do in The Crescent City (yes, that’s another name for New Orleans) we saw in several books and websites that you needed to get out of the Quarter, and we couldn’t agree more. Although there’s not much to do either, visits to Mid-City, Uptown and Garden District are a must. You need to hop on the streetcar, the oldest continuously operating wooden streetcar in the country. Get on the green streetcar at St. Charles Avenue (near Canal Street). This will take you to the beautiful Garden District. While there, you can take a walking tour or just walk around the colonial mansions. There are several to watch out for like the ex residence of author Anne Rice (‘An interview with a vampire’ saga), MTV’s Real World’s house and many others. At the District there’s also the Lafayette No. 1 Cemetery. It is a pretty cemetery but if you don’t like walking among the dead, you can have lunch in the posh and much known Commander’s Palace (more on that restaurant later). You can also explore Magazine Street, the lower side on the Garden District. It has a lot of boutique shops and restaurants. The same goes for the Esplanade Avenue, which is similar to the Garden District with its houses and architectural styles. Esplanade is also the birthplace of Impressionist painter Edgar Degas's mother and grandmother, and the only studio belonging to the former artist that is open to the public. If you have the opportunity, go and visit it but check times, we went and it was closed. The St. Charles Streetcar can also take you to the Audobon Park that houses the Audobon Zoo. But if you are looking for art, hop back on the streetcar to Canal St. and take the red streetcar to City Park. This park, bigger in size than New York City’s Central Park, has beautiful Spanish moss-draped giant live oaks, the New Orleans Museum of Art, an amazing Sculpture Garden, lakes to wander around, a kids' amusement park and Storybook Land, also for kids. It also has a Botanical Garden, perfect for the plant and flowers lovers. Apparently Katrina hit this park hard and it is slowly getting back in shape. Is a family spot that is busier on the weekends but during the weekdays can be solitary, so take precautions while exploring it. Now let’s talk about the best thing in New Orleans: food! But where to start??? There are so many restaurants, options for you to try that if wemention them all, this post would never end. Therefore we will highlight the places that we visited and mentioned a few that we wished we did (there are a lot actually). As soon as we arrived to the Big Easy, we headed to the French Quarter – of course. There we recognized the restaurant Acme Oyster House(Iverbille St). We went in and ordered the famous charbroiled oysters that can be found at several restaurants in the city. The oysters are filled with garlic butter and parmesan/romano cheese and broiled to perfection. It is one of the best things I have ever tasted in my life!! Since Jose’s allergic, he went for the chicken and andouille sausage gumbo which was delicious as well. You can find delicious oysters at Felix’s, Donna’s and Drago’s. If I had had it my way, I would have started every day by having breakfast at Café Du Monde, at the French Market near Jackson Square or the little shops they have around the city like the one the in Riverwalk mall. Is not a real breakfast but is the Big Easy breakfast: chicory coffee (in the famous form of a café au lait) and sugary beignets: delicious fried dough sprinkled with lots of confectionary sugar. I could have eaten beignets for breakfast, lunch, dinner and snacks in between! They are so good! Our weekend in New Orleans was tasked with finding the best gumbo and Po-boy’s in the city. We tried a seafood gumbo at Johnny’s Po-Boy’s (St. Louis St. ) as well as the fried shrimp and fried catfish po-boy’s. The gumbo was good, but it had too many okras and not that much seafood. The po-boy’s were excellent! However, the best po-boy we give it hands down to the ones we had at Parkway Bakery and Tavern in Mid-City near the St. John Bayou. Located in Hagan Avenue and Toulouse St., this place was founded in 1911 and it served as a bakery, therefore it’s name. But in 1929 they added the ‘poor boy’ sandwich that was created in the Martin Brothers Coffee Stand and Restaurant. These brothers named this sandwich after inventing it to feed the streetcar drivers – the poor boys. And the term ‘po-boy’ was created. In 1978 the Parkway Bakery closed due to a flood that destroyed their famous bread ovens. It closed in 1993 shortly after the American Can Company in front of them closed too. However, it was bought in 1995 but it took years to reopened in again. It was in 2003 that the bakery started serving their beloved po-boy’s again. And then in 2005, Hurricane Katrina came. Parkway was under six feet of water. Thanks to the community, it re-opened again in December of that same year. This little place, with so much history, indeed makes delicious po-boy’s. In fact, they have 25 different styles that include seafood, sausage, ham, etc. I had the fried shrimp one of course and Jose tried the most popular one, the roast beef po-boy. You can order them ‘dressed’ which is basically lettuce, mayo, tomato and pickles or ‘undressed’. We also had gumbo at Coops Place, a small and crowded restaurant in Decatur St. near the French Market (right in front of Margaritaville). There,the gumbo was good, more seafood, with lots of shrimp, oysters and crawfish. Their best dish is definitely the fried chicken, crispy on the outside and tender and juicy on the inside. The big disappointments were the jambalaya and the red beans. The jambalaya was gooey and it tasted funny. They make it with rabbit and andouille sausage but the taste wasn’t there at all. It was just a gooey mess of rice. Then there were the red beans, again no taste. Especially if we compared them to the ones we had at the Gumbo Shop (St. Peter St.) They were simmered to perfection with andouille sausage and Cajun spices. It was a perfect mix of heat and soulfulness.